The UC Natural Reserve System, established in 1965 to support field research, teaching, and public service in natural environments, has become a prototype of conservation and land stewardship looked to by natural resource managers throughout the world. From its modest beginnings of seven sites, the UC NRS has grown to encompass more than 750,000 wildland acres. 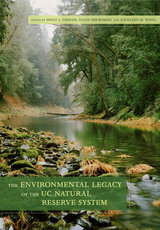 This book tells the story of how a few forward-thinking UC faculty, who’d had their research plots and teaching spots destroyed by development and habitat degradation, devised a way to save representative examples of many of California’s major ecosystems. Working together with conservation-minded donors and landowners, with state and federal agencies, and with land trusts and private conservation organizations, they founded what would become the world’s largest university-administered natural reserve system—a legacy of lasting significance and utility. This lavishly illustrated volume, which includes images by famed photographers Ansel Adams and Galen Rowell, describes the natural and human histories of the system’s many reserves. Located throughout California, these wildland habitats range from coastal tide pools to inland deserts, from lush wetlands to ancient forests, and from vernal pools to oak savannas. By supporting teaching, research, and public service within such protected landscapes, the UC NRS contributes to the understanding and wise stewardship of the Earth. Peggy L. Fiedler is the systemwide director of the UC Natural Reserve System. She was Professor of Biology at California State University, San Francisco, from 1989—2000, and founder of San Francisco State’s graduate program in conservation biology. She is the lead co-editor of Conservation Biology: The Theory and Practice of Nature Conservation, Preservation, and Management, Conservation Biology: For the Coming Decade, and the author of Rare Lilies of California. Susan Gee Rumsey joined the UC NRS in 1987 and was its principal publications coordinator until her retirement in 2011. She was responsible for more than twenty years of the NRS Transect newsletter, as well as the 2010 publication of Mountain Time: Reflections on the Wild World and Our Place In It, the final book written by NRS founder Kenneth S. Norris. Kathleen M. Wong is the principal publications coordinator of the UC NRS. Formerly editor for California Wild, the magazine of the California Academy of Sciences in San Francisco until 2006, she has written for such widely read environmental publications as Bay Nature and Nature. She is the co-author, along with Ariel Rubissow Okamoto, of Natural History of San Francisco Bay, a California Natural History Guide published by UC Press.